The Australian coffee shop trade is outpacing the overall economy, so if you have a passion for coffee and customer service, then here are some tips on how to buy a coffee shop. Few categories on BusinessesForSale.com have a wider choice of options than coffee shops. Australians love their coffee and there are nearly 19,000 coffee shops across the country. But first you must decide what kind of outlet you want – and can afford. Make a shortlist of your priorities. It could be a specific town or state, or just anywhere rural, on a high street or in a city centre. Perhaps you want to inherit a diverse, premium quality menu or large premises with considerable revenue potential. You may want to cook hot food, in which case decent kitchen facilities are necessary. Perhaps you’ll only consider highly profitable enterprises, or you might relish the challenge – and lower purchase price – of buying and turning round a struggling business. You may have to compromise on certain priorities depending on your budget. The more profitable, the bigger and better equipped and the better its reputation, the higher the asking price is going to be. You can quickly generate a shortlist of potential acquisitions by filtering coffee shops for sale on BusinessesForSale.com according to your budget and preferences – price, location, sales revenue, real property or leasehold, accommodation included or not, owner financed and so on. The seller will probably have hired a business broker to value the business, but you could enlist your own professional valuer to conduct an independent valuation. Coffee shops are valued primarily according to a multiple of average profits over several years, together with the value of premises, equipment and stock. For all the figures and formulae that go into valuation, a business is only worth what the buyer is willing to pay and the seller is willing to accept. If you can see potential to improve the coffee shop’s fortunes without excessive investment of time or money, then the asking price may prove a bargain. A period of due diligence follows the conclusion of a deal agreed in principle. Footfall outside – can you rely on passing trade? How busy does the coffee shop get – in the morning and afternoon, midweek and weekends? The help of professional experts in business acquisitions – such as lawyers, accountants and/or business brokers – could make a real difference in securing your dream business. They can help you secure funding and with business valuation, obtaining and scrutinising paperwork, negotiations, due diligence and closing the deal. How extensive is the training provided? Can they reassure you that a background in the trade is no impediment to success? Through what mediums can you get advice and support – email, phone, in person? Can they help you even outside of normal opening hours and how quickly will they respond? Is there ongoing training and support for your staff? How good is their coffee? Again, a bit of Google research will reveal reviews and opinions from within the industry about various coffee machines. From where do they source coffee beans? Check out Beanhunter to see what customers think – but of course, try the coffee yourself too. Will they let you speak to existing franchisees of your choice (rather than handpicking the most successful ones themselves)? Might you consider a van-based coffee franchise? With shop rents in Melbourne and Sydney among the highest in the world, a mobile coffee franchise might be an appealing alternative if you can’t afford – or would rather not risk the financial investment in – a coffee shop franchise. These van-based options either service and refill machines within workplaces or dispense coffee at outdoor events or outside offices. Browse coffee shops for sale here or coffee franchises for sale here. 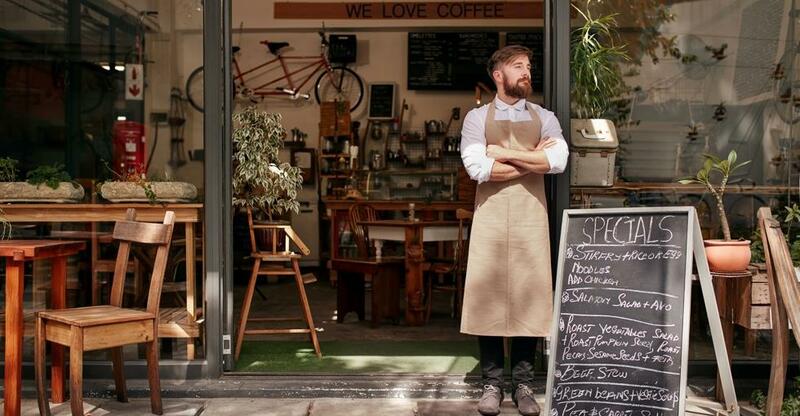 We examine some of the practical considerations around running a coffee shop or coffee franchise, including sourcing good coffee, choosing the right machines and recruiting skilled baristas.